Like a lot of collectors, my interest in Hamilton was piqued by inheriting a couple of pocket watches. I carried them from location to location in an old cookie tin for about 20 years. When I eventually got them repaired, I found the ticking and substantial size of the watches to be very pleasant and soothing. Maybe it reminded me of Sunday evenings growing up and listening to my folks watch 60 minutes. I started to collect additional pocket watches but, after a few models, I realized that I didn't really use them very often and my enjoyment waned. When I discovered Hamilton actually made wrist watches, I quickly shifted to collecting them. I found I typically spent more money on getting them repaired than I did to acquire them. Eventually I became determined to teach myself how to do it... and as they say, the rest is history. 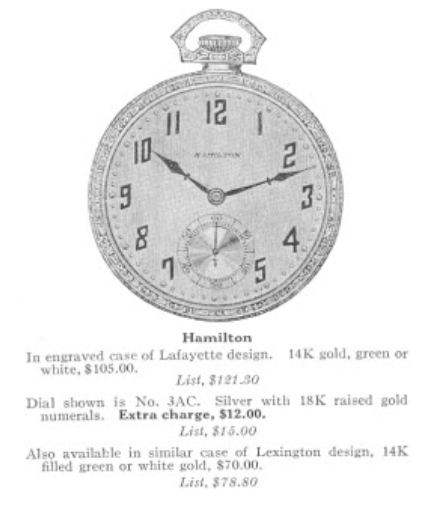 Anyway, you would probably be surprised by how many different pocket watch models Hamilton made. With the exception of a couple of rare early examples, everything Hamilton made was a quality 17 jewel movement or better. You could find models with 17, 19, 21 or 23 jewels in hunter cased or open faced configurations. Sizes ranged from 12 size, to 16 and 18 size models. You had a lot to choose from. Now days most pocket watch collectors are interested in 21 jewel or better, 16 or 18 size railroad grade pocket watches. The smaller 12 size dress pocket watches don't get a lot of attention unless they are the highest grade movements. I've restored many of the various pocket watch movements but I noticed there are a few that I haven't gotten to yet. One of them is the 19 jewel 918 movement. The 918 was introduced in 1928 and is a mid-grade 12 size dress pocket watch. It's a third generation model and replaced the 19 jewel 902, 12 size pocket watch movement. The 902 replaced the original 19 jewel pocket watch movement produced since the turn of the century, like the 900. You'll find the 918 was used in solid gold as well as gold filled models and is a step above the more common 17 jewel 912 movement produced at the same time. In the early days, you would go into a jewelry store and pick out a pocket watch movement with dial and hands and then pick out a separate watch case and the jeweler would assemble it all for you. There were watch movement manufacturers and there were watch case manufactures. 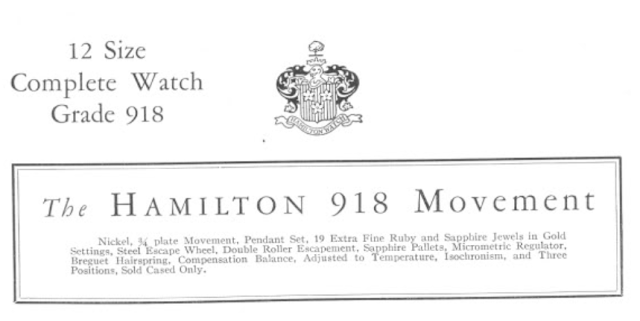 Eventually, watch movement manufacturers started to sell models pre-cased and by the 1920's, Hamilton sold pocket watches in named cases but you could still choose the dial you wanted. I recently picked up a 918 pocket watch and it caught my eye because it has a very interesting dial. It looks like a checker board and it has raised gold numerals since the watch predates the term, applied gold numerals. Looking closely at the case and the pendant style, you can identify this model as a Lexington, since it's white gold filled. I was unable to identify what the name of the dial is but it's definitely a legitimate Hamilton dial. The back of the case is in great shape. It snaps closed tightly and with a little polish with shine like a mirror. There's a dusty cover under the back cover and this one looks almost new. There are a few scratches from someone trying to get it open but otherwise it looks pristine. It's hard to make out in my photo below but case back has Hamilton Watch Co in very ornate engraving. The 918 movement looks very similar to the 912. It also shares most of the same parts as the 912. The 918 has extra cap jewels on the escape wheel pivots and brings the jewel count to 19. The front bezel has to be removed in order to get the movement to come out of the case. The dial has some wear along sides and some dirt around a few of the numerals. Hopefully I will be able to clean that up without damaging the rest of the dial. With the movement out of the case, I can lift off the hands and then unscrew the three dial foot screws. Then I can lift off the dial. The dial-side of the main plate shows the set of springs that keep this negative set movement in the time setting position when it's out of the case. When the stem is pushed in, it overcomes these springs to put the watch in the winding position. If the sleeve in the watch case is worn, the movement can push the stem out to the setting position - which is always a pain when it comes to pocket watches like this. That's one reason why railroad grade watches are lever set and not negative set like a dress watch. With all of the tension relieved from the mainspring, I can start to take the movement apart. First off are the large winding and ratchet wheels. It's best to match the size of the screwdriver to the side of the screw head. The screw on the winding wheel is reverse threaded, so you need to remember to turn it clockwise to loosen it... or you might break it off. The barrel bridge comes off after three screws are removed. You can see a lot of excess green mainspring grease inside of this watch. It's kind of nasty and would surely have gummed up the watch if it wasn't cleaned. Two screws hold the train bridge on and with that removed you can see all of the wheels in the gear train are now exposed and can be removed. The mainspring is mostly-set. It's a good idea to replace a mainspring when it gets to the point that it's stays in a position like this... it has half of the energy it used to have. The inside of the barrel is full of extra grease too. The last thing to come off is the wish-boned shaped pallet bridge. Two screws hold it on and once they're removed all of the parts are ready to be cleaned. Here's a fresh white alloy mainspring for installation once the barrel comes out of the ultrasonic. You can tell by the green color of the cleaning solution that this movement was overdue for a cleaning. Normally the color is a light yellow. Everything is cleaned and ready to be put back together. The new mainspring is installed in the barrel and now I have to put the arbor back in before I put the cover back on. The movement is now reassembled and running... off to the timer to see how it's performing. It's running a bit slow and the beat error is on the high side of acceptable. Even with the regulator set to "full fast", the best I can get the timing up to is 13 seconds slow per day. This movement has a micro-regulator and I don't like having the goose neck so flexed outward by setting the regulator to full fast. This will call for my best poising skills, as this balance needs some serious work. First off I will try to reduce the beat error by better centering the balance with the pallet fork. Based on the shot below I was initially very happy by how close the two lines were. Then I realized that they were actually so far apart that they only appeared to be close. The beat error is now 9.9ms... so I must have adjusted the hairspring in the wrong direction. Eventually I got the balance back in beat and then I set the regulator to the middle - where it should ideally be. Unfortunately, with the regulator set to the middle, the watch now runs over six minutes slow per day. When a watch runs slow, if you take weight off of it the speed will increase. When a watch runs too fast, you add weight - but you have to put it in the right place. In order to dynamically poise the balance, you need to release the mainspring tension and then wind the watch just enough that it starts to run with low amplitude. With the watch running with about 180 degrees of amplitude, I record the performance in all six positions... dial up (DU), dial down (DD), pendant up (PU), pendant down (PD), pendant right (PR) and pendant left (PL). Then, wherever the watch runs fastest, you know the heaviest side of the balance in below the center of the balance. You can see below that the watch runs the fasted (or least slow) in between PL and PD. This is the position between PL and PD. If you draw an imaginary line straight down from the center balance jewel, you can mark the spot where the balance wheel is heaviest. In the shot below, the tip of my tweezers is pointed toward the heavy spot. Since the watch runs slow, I want to remove weight from this side, adding weight to the other side will slow the watch down, even though the balance will be better poised. Notice there is a timing screw in this position. If I screw it in the watch will gain speed, just like how a spinning figure skater spins faster when she pulls her arms in. I screwed it in a couple of turns and now you can see how the timing changed. The DU and DD positions are pretty good but everything else is still wacky. This is the fastest running position again. Well, it took me about 20 attempts but I finally got to the low amplitude performance shown below. PR and PL are a little opposed but otherwise things look good. Running at such low amplitude exaggerates the variation in each position. Once I wind the watch fully, things should really tighten up. Here's dial up on the timer with the watch fully wound... right on the money. And here's what the performance in all six positions looks like with the watch fully wound. Not bad for an almost 90 year old pocket watch and well within the three positions that Hamilton watchmakers originally adjusted the movement to (PU, DU and DD within 30 seconds per day). Here's the finished watch, back in it's case with the cleaned up dial. There's nothing I can do about the paint loss on the sides but my camera makes it look a lot worse than it really is. In fact, my camera didn't pick up the two-tone pattern of the checker board field. This watch actually looks really good in person. Too bad the movement is covered by two covers. I like to look at the movement as mush as I do the dial. Is this the same watch as the first pic. Also I have one very similar only different I see are mine are black numbers not gold. What would the value of this watch in working order? I'm looking for information on it and a fair listing price for eBay. Also it's engraved would that change the value of the watch. Yes, it's the same watch throughout the thread. Look at closed (sold) listings on eBay to find out what the typical price for a similar watch sells at. The 918 is a nice movement but it's not top of the line. The quality of the case and the dial are important factors too. Plus it's service history and when it was last overhauled. Engravings usually aren't a big factor... some people like them, some people don't. I have a 918 that has the raised gold numbers and a woodgrain looking dial. It's nice and looks to be very old. Would you be interested in seeing it? I'm familiar with the dial. There are so many 12 size dial options that you could assemble quite a collection of different watches just by varying the dial chosen.